The ultrasound machine gives the parents the ability to talk to the unborn by their gender, taking the intersexed nine-month conversation away from the child. The opportunities limit us in our new world. Encourage parents to not know, encourage parents to allow anticipation on either end. Escalators are a nice ride, slowly rising and falling, writing while riding, notes for the poem, meeting new people at either end, "Excuse me, EXCUSE ME. . . ." My escalator notes became a poem. 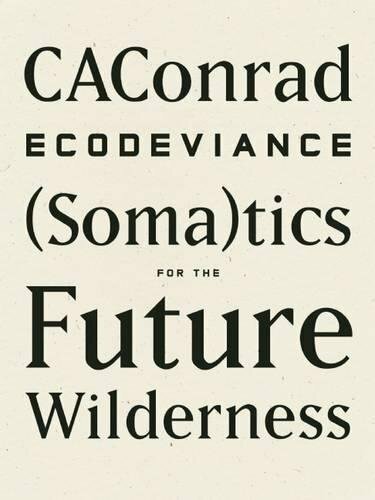 CAConrad's ECODEVIANCE contains twenty-three new (Soma)tic writing exercises and their resulting poems, in which he pushes his political and ecological efforts even further. These exercises, unorthodox steps in the writing process, work to break the reader and writer out of the quotidian and into a more politically and physically aware present. In performing these rituals, CAConrad looks through a sharper lens and confirms the necessity of poetry and politics. CAConrad is the author of A Beautiful Marsupial Afternoon (Wave Books, 2012) and The Book of Frank (Wave Books, 2010/Chax Press, 2009), as well as several other books of poetry and essays. A 2014 Lannan Fellow, a 2013 MacDowell Fellow, and a 2011 Pew Fellow, he also conducts workshops on (Soma)tic poetry and Ecopoetics. If you have any questions about this product by Wave Books, contact us by completing and submitting the form below. If you are looking for a specif part number, please include it with your message.